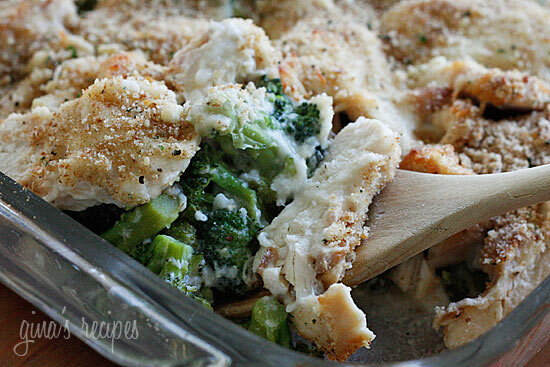 Broccoli and chicken in a creamy cheesy sauce, topped with more cheese and breadcrumbs. Your family will thank you for this! 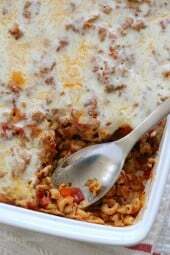 Casseroles are highly requested makeovers, so I will try to publish at least one new casserole a week. Put in your requests here if you have a favorite. Chicken Divan was created in the 1930s at the Divan Parisian Restaurant in Manhattan, and since has become an American classic. While most recipes call for mayonnaise, canned soup, and a lot more fat, this recipe has been significantly lightened up to maintain it’s flavor without all the added fat. You can make this quicker by using leftover chicken, or precooked chicken breasts. Can you use frozen broccoli? Yes, of course you can, but nothing beats the flavor of fresh broccoli in my opinion. I served this with a green salad on the side to make this a complete meal. Bring a large pot of water to a boil. Add the broccoli and blanch 3 minutes. Rinse with cold water to stop the cooking. Using a grill pan or Forman grill, saute chicken on medium-low heat on both sides until browned, and just about cooked through, about 5 minutes on each side. Remove from heat and transfer chicken to a cutting board. Add the butter and oil until melted and then add garlic and shallots. Stir in broth, milk and sherry and bring to a boil. Remove from heat and stir in half of the swiss cheese. Arrange the chicken on top and cover with remaining sauce. Sprinkle the remaining swiss cheese, grated parmesan and top with breadcrumbs. Cheryl, I don't either but started to after so many requests for them. Rebekah- I hope to soon!! This dish was fantastic! I even made it twice in one week and took one portion to a friend who had just come home from the hospital. It felt so nice to take a healthy, & filling home-cooked meal to a friend recovering. LOVE this site!!!! Please publish a cookbook!! This was such a hit with my children. I don't usually make casseroles, but they all LOVED this! My 8 yr. old wants it every night, lol! Thank you! What a sweet husband you are! Ok so I usually give my wife the recipe off of your site but this time I cooked for the first time ever. I waited for her to come home and eat. She couldn't believe it and when asked I told her it was from Gina. I want to thankyou for the recipe. It was fantastic!!! I recommend this recipe. I agree, you can never have too much garlic!! Tiffany, mushrooms would be wonderful in this! And would give you bigger portions. Thanks! p.s. I'm just now reading comments & forgot to mention that I did pencil in on my printed out recipe to add mushrooms next time during the sauteing process b/c I think it would be so good w/ them. I see I'm not alone. I made this last night and LOVED it! It's a keeper, especially since I can make rice on the side for my husband to put it on top of and I don't feel like I'm depriving him of a substantial meal while I'm trying to be good. Thank you so much!!! I just made this tonight and it is FANTASTIC! I couldn't find reduced fat swiss, so I used regular, but didn't use quite as much. I'm also making it into 8 6-points plus servings instead of the other way around. I used more shallots and garlic than called for, but I don't think "too much garlic" exists! It is seriously fantastic! I'd never even had Chicken Divan. It's amazing that now that I'm doing Weight Watchers, I'm trying so many wonderful new things, thanks to you, Gina! Pat, yes, I think it would freeze fine. Most casseroles do. I have a freezer friendly section too. Just have to tell you that we made this for supper tonight and it was FANTASTIC! Yummy comfort food for not many points! Do you think this can be made ahead and frozen? I am helping my very pregnant daughter stock up her freezer before the baby comes, and this looks wonderful. Did you ever consider adding a note to your other casserole recipies stating whether or not they would be good candidates for the freezer? I love the new plan! I've lost twenty pounds on it without a plateau. It is amazing how everybody reacts differently to changes. Gina, I was reading all the comments and I noticed that you mentioned you have mistakes sometimes. So, who do you test your recipes on, my husband often complains about being my test subject. I think he is afraid that he is the first!!!! Your Divan was divine, thanks! Love the changes and adding mushrooms! I'm sure this is good with any cheese! I wasn't sure I would like this one, but I've tried almost all your other recipes and everyone seemed so wowed by it on the comments, so I decided to give it a whirl…AMAZING! Loved every last bite, so did my kids! I couldn't find shredded swiss so I did what someone else suggested and used the Laughing Cow light swiss and then sprinkled it with a little fat free cheddar. Ridiculously good! I have a new favorite recipe! Wow! This was delish. I served it over rice and it was amazing. I didn't have wine or sherry in the house and it was still good! Thank you so much! I have tried a lot of your recipes and love every one of them. Tried this tonight! It was fantastic. My husband loved it! Thanks for such wonderful ideas!! I made this last night, and my husband couldn't get enough! We've never had Chicken Divan before, but I think we're hooked! We used red. fat casserole cheese (mozz, cheddar, and monterrey jack) and it was delicious! Thanks Gina!! I just made this tonight for the first time. In fact, this was my first time trying Chicken Divan. I only had Monterrey Jack and Cheddar cheese, so I used a little of both. Oh my goodness. This came out SO delicious and smelled so good while it was baking! I always make new recipes when my brothers come over and they always say, "Oh no. G is making one of her experiments again." They gobbled this one up! Thanks for another awesome recipe!! I've made this several times and it's very yummy. It's now one of our regular go-to meals. 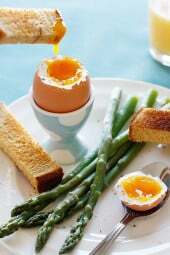 I love your site and you have fantastic recipes. Thanks for your hard work! I really enjoy your blog and have made this recipe twice now. It is a big hit with both the 4 yr old and hubby! Thank you so much for sharing with us! I just made this for dinner (New Years Day) It was so delicious, the whole family loved it. This one is definitely going in the recipe box! I made this using leftover turkey from Christmas dinner and my husband and I both LOVED it! This one is a keeper. I always buy Pecorino Romano and Parmigiano Reggiano. They cost a little more, but the flavor is so much better. Since we are cutting so much fat out of our diet I feel it's really important to use quality ingredients. It really makes a BIG difference. Gina, can you tell me if the grated parm is fresh or the Kraft brand in the green and yellow plastic container? I couldn't tell from the photo. Can't wait to make this! This is SO much lighter but still looks fantastic! I love a good casserole. Make this for dinner tonight and it was delicious and very easy to make. Thank you! Thanks for this delicious recipe! My fiance loves Chicken Divan and I was so happy to see this healthier version. He has seconds! I also appreciate all of the other comments and that you answer them! I'm going to use reduced fat cheddar next time I think. Made this for dinner tonight and it was INCREDIBLE. I will definitely use this recipe many more times. I made this a couple of nights ago and it was yummy! I knew I'd be making it on a busy night, so I bought a bag of diced oven-roasted chicken to use (w/fresh brocolli) and it tasted great in the casserole. I made a half batch and it was the perfect amount for my small family for dinner, plus lunch for me the next day. Thanks Gina! 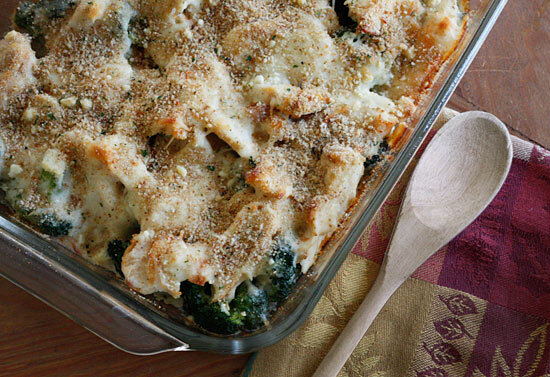 Chicken Divan is one of my favorite dishes…but I haven't made it in forever because of the amount of calories and fat! I love that you made this WW friendly…and thank you so much for including the old points as well, I'm not switching over! Made this yesterday for my parents (im the cook of the house) and they loved it. My mom especially loved the broccoli. Honestly you are a genius. Just made this for my roommates and they loved it! I joined weight watchers a few weeks ago, and as a college student this website has saved me with amazing new recipes for me to try without having to go far! Thank you, Gina! I just made this and it was really good! Only thing is my husband called while I was making it and I forgot to put in half of the flour so…was a little runny but – flavor was delish! I added tarragon when I salt/peppered the chicken breasts and also added a container of sliced cremini mushrooms to the recipe as well….YUM! Can't wait to try it again using ALL the flour 🙂 Thanks for all your recipes! Not a fan of broccoli, huh? Let me know how he likes it. 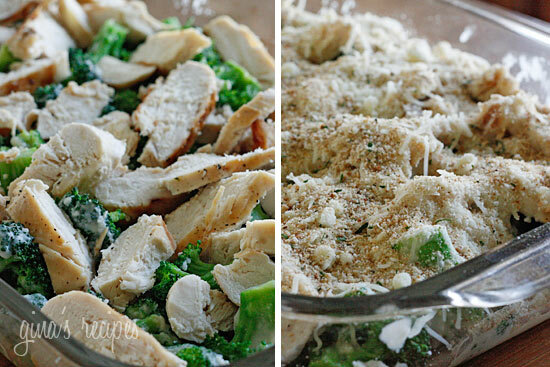 I made this dish this morning put it in the fridge will bake for tonights dinner- I cannot wait, it smelled sooo good…. My husband said what is all that broccoli for LOL I said just wait til you taste it before you go sour on me…. I wish more people realized Healthy can be Delicious! How about a make over of the good ole' tator tot casserole? My little one loves it…but it is like a brick of meat and tots! I think this would be great to freeze. This looks absolutely delicious!! Do you think this could be frozen for later? This is the first time i visit your blog… i'm bookmarking it to save other recipes for later… This one is very tasty! Great idea Christine, never thought of using Laughing Cow! I used half laughing cow light Swiss in the sauce and then grated Swiss on to of everything and the sauce came out really creamy and delicious! Thanks for a terrific recipe Gina! Thanks Gina! I made this for dinner tonight. Next time I will reduce the amount of broccoli (way to much for me) and increase the amount of chicken. Otherwise it was delish! I made this last night and it was so good. I got a little crazy with the salt, but it still tasted so decadent! I've lost over 20 lbs and I honestly think that I owe a lot of that to Gina!! I like to COOK. I'm not interested in quick fix meals and was upset that I would not be able to really cook tasty food on ww. Thanks for all of the wonderful recipes and keep them coming!! This sounds great! It looks like one of those dishes that tastes bad for you but isn't! This looks fantastic! I plan to make this dish this coming dish. Thank you for using the new Points Plus! I bet that is a lot of work for you! We appreciate it! Look at that cheese all over the chicken! Yummy! Gina, you hit it out of the park with this one!! Just made it for dinner and both my husband and I went back for seconds. I did notice that the oil and shallots were left out of the instructions, but it was pretty easy to figure out where they fit in. As a time saver, I used 2 drained cans of Kirkland's canned chicken breast (from Costco), which is already cooked. I also used light cheddar cheese instead of swiss, only because the store I went to didn't have light swiss. Anyway, it was fabulous. I thought the sherry was the crowning touch– made it perfect! I am forwarding this recipe to many people I know! This would be a GREAT make-ahead meal. Gina, Quick question? When do you cook the 2 Tbsp shallots? I also noticed 2 Tsp of olive oil? When you you add this ingredient? Please adjust your recipe as I a a very novice cook. Thank you for all you do. Yum! I'm trying this next week. 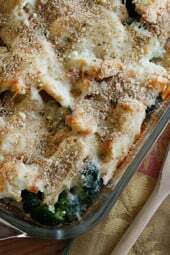 I'd love to see a lighter version of my two favorite casseroles: sweet potato (the brown sugar and nut topped variety, not marshmallows) and broccoli. This was absolutely delicious! Thanks for all you do! You could always leave it out Allison. Is there anything non-alcoholic that I can use in place of the sherry or white wine? This looks delicious! I am just starting to learn the new PointsPlus program, so thank you for updating so quickly! Thanks Kathryn!! So are you saying you didn't use any butter or oil? It is what it is- thanks for noticing that! Melt butter and oil, then sauté galic and shallots. Then add flour. I made this tonight. I added poultry seasoning to the chicken when I sauteed it which gave added flavor. When I serve this as left overs tomorrow I am going to serve it with (over, perhaps, or mixed in) some whole grain penne thus making it a bit of a chicken pasta primavera. Question: the recipe calls for olive oil and shallot although I didn't see where the shallot was used and the only reference to the oil was to "spray a little oil on top" at the end before baking (which I doubt would be 2 tsp, but could be I guess). Just wanted to clarify that for future reference. And, I used low fat mozzarella as I forget to get the swiss and it was fine, but I think I'd like the bite of swiss a little better in this. wwsuzi- Great gift for new moms! Yes, I would put it all together and let them bake it. Easy! If you cook it then re-heat it, you just want to be sure you don't dry the chicken out. Rachel, not ALL my recipes, big job! But I'm making my way through them. YUM! 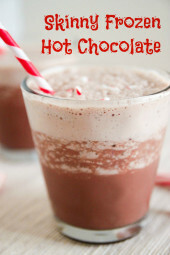 I'm going to make this this weekend! I can't believe you've converted all your recipes (past AND present!!) to PointsPlus…you rock! This looks great – can't wait to try! Any sense of how this would fare reheated? Or preprepared and delivered? I'm always on the lookout for tasty things which can be given to new parents, but everything that's good and reheats well is usually fattening! WOW…My mom used to make chicken divan when I was little. I'm going to send this over to her, and make it myself! THanks for posting old and new point values…it'll be a real help as we all adjust to the new points system! Thank you for incorporating points+! This will definitely help me in adjusting to the new program! I've never had Chicken Divan before but it looks very good! As usual, great lightened up recipe! I made something similar this week with ground turkey breast, broccoli and a light cheese sauce (for the anonymous question re: cheese, I used 2% Mexican Four Blend Shredded Cheese). Thanks for helping with the printing issues. The Chicken Divan recipe looks devine! I can't wait to try it. YUM! Everything you made looks so delicious that I want to bite the screen!! Love you all! Ok, cheese- Use any cheese you want, it originally calls for gruyere, but reduced fat cheddar or mozzarella I'm sure would be good. I could have cheated with a canned soup recipe, but honestly, I've never made a casserole with canned soup, am I the only one? Making this from scratch gives you a lot of control of exactly what goes into it. And yes, the print button is awesome! My designer, Kristin Call was able to find this feature and it's great. I'm putting her button up soon if anyone has a blog and needs this feature. Just make sure you click on the recipe before you use the button or it won't work right. Still tweaking. PointsPlus- Yes, I am busy adding new points to all my older recipes, so thanks for your patience! If there is a recipe you want me to prioritize, leave a comment under that recipe and I'll do my best. Awesome! An early Christmas gift! By some magic, I can now PRINT recipes! A magic "PRINT" button mysteriously appeared and solved my printing problem. Now I hope it doesn't disappear as mysteriously as it appeared! Love these recipes, Gina! Thanks! As many others have expressed, Thx for posting the PointsPlus so quickly! I am going to forward this to all my WW PointsPlus buddies. Looks delicious. Thanks for the points plus already! I have been eating from your site for the past 6 months and I have lost 65lbs and my husband has lost 45lbs. Most importantly my young children are growing up in a healthy house! I have always wanted to make this dish! I love that you are not using canned soup. Thanks for posting. One question: is there another type of cheese that would work well for this dish? I am not a fan of swiss. This looks so delish! I may be going to the store so I can make this tonight. I love the new print feature. I recently discovered your site and have already made several things from it, all of which have been wonderful. Thanks so much for the time and dedication you put into publishing your recipes. I am amazed that you are so on the ball that you are already listing the new WW Points Plus! Amazing. I was just thinking last week that I'd love to try Chicken Divan again, but wondered if I could make it lighter. Then I thought of you. Then I saw this! You must be a mind reader. Thanks. This looks delicious and even I think I can do this! Thanks, can't wait to make it. yum!!! cant wait to try – thanks for posting the new points – i love the new plan. scared me at first but its so much better – still have a lot to learn about it but I love free fruit! This looks so good. My family loves chicken divan but I'm always worried about how much fat is in it, so I'm thrilled that you've lightened up our favorite recipe. THANK YOU for posting the old points as well!!! im not switching over…totally anti. This will really help a lot of your followers who are like me! is there anything you do that DOESN'T look fabulous? This sounds delicious!! I can't wait to try it. I love chicken divan and this sounds so much healthier.